Microcontrollers are powerful ways to connect inputs and outputs. Incoming voltage changes can be read from sensors and interpreted as data. And just like with when we use actuators (outputs), sensors (inputs) can also be digital or analog. A button, or a switch which is on or off, are both examples of a digital sensors because they only two states. A volume knob, also known as a potentiometer, is an example of a analog sensor. It produces a range of values. In your kits you have a light sensor and a temperature sensor both of which are analog sensors. Pins 0-13 are for digital sensing and pins A0-A5 (on the other side of your board) are for analog sensing. Analog sensors must be connected to analog pins. (A0-A5) and by using the analogRead(); function we can read values of changing voltage from them. This function returns a number between 0 and 1023, which represents voltages between 0 and 5 volts. For example, if there is a voltage of 2.5 V applied to pin number 0, analogRead(0) returns 512. 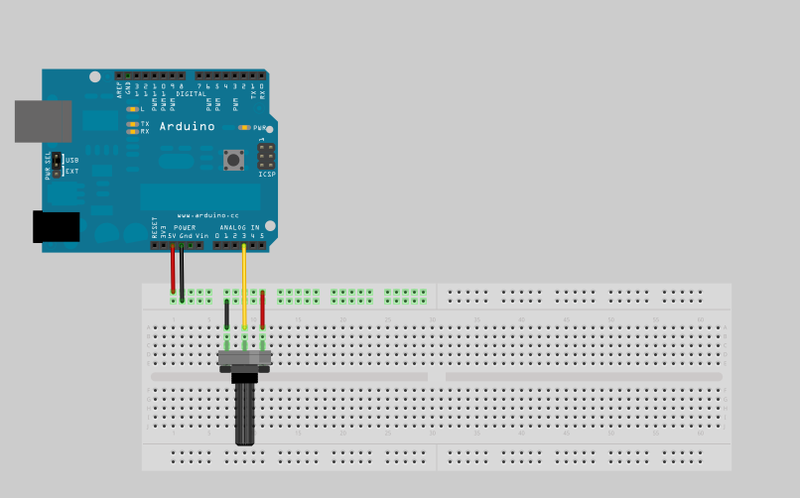 (you could also insert your own LED into pins 13 and GND as shown in “Blinking an LED” in Chapter 4) blinking at a rate that’s dependent upon the amount of light that hits the sensor. Now, try Example 02C: but before you do, you’ll need to modify your circuit. Take a look at the next figure and hook the LED up to pin 9 as shown. Because you’ve already got some components on the breadboard, you’ll need to find a spot on the breadboard where the LED, wires, and resistor won’t overlap with the LDR circuit. NoTe: we specify the brightness by dividing val by 4, because analogRead() returns a number up to 1023, and analogWrite() accepts a maximum of 255. Using the same circuit that you have seen in the previous section, you can connect a lot of other resistive sensors that work in more or less the same way. For examples, see the booklet included in your kits and try the force sensor example on page 32. Notice we don’t have to set the pin in void setup to INPUT. This is because A0-A5 are always input pins. Open up you serial monitor and have a look at the values coming from your potentiometer. This example uses a pull down resistor. Buttons often require what are called pull down or pull up resistors. This is a way of controlling their voltage when their circuit is open. 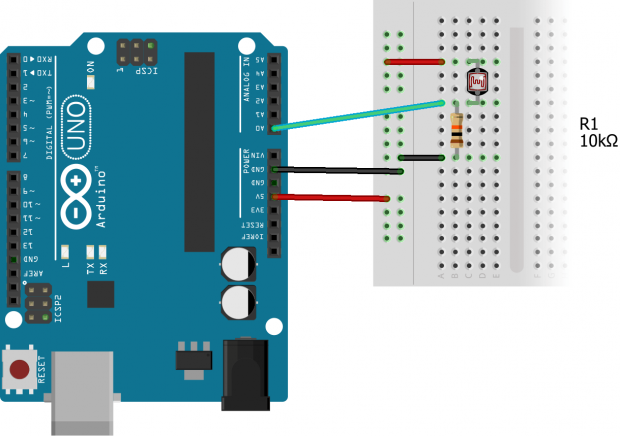 Open circuits can have a voltage that floats around making it difficult for the Arduino to read. So we put a resistor in to make sure the voltage doesn’t float when the button is open.